“Selling Monte Bello en primeur came about totally by accident,” Paul Draper told me recently. “In 1984, Bordeaux had a very weak harvest. The London merchants told us the vintage did not look all that promising and asked us if we would be interested in selling Monte Bello futures. And that is how en primeur started for Monte Bello.” I recently had a chance to taste the 2017 Monte Bello in component lots and in a core base blend with Draper and current Ridge Winemaker Eric Baugher, who worked alongside Draper for more than twenty years before taking over the helm when Draper retired from day to day operations in 2016. 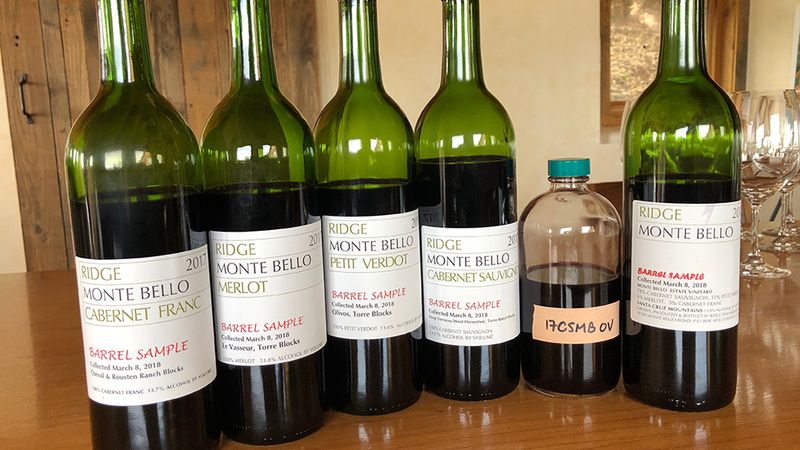 For more historical perspective on Ridge and Monte Bello, readers may want to refer to my articles Ridge Monte Bello: Past, Present and Future, published in July 2015 and its companion piece, Ridge Monte Bello Revisited: 1968 – 2012, published in July 2016. Two thousand seventeen was a highly unusual year in the Santa Cruz Mountains. “The winter was very wet, which delayed pruning. The growing season was marked by extremes of heat and cold during the summer to a degree we have never seen before. September was especially cool,” Paul Draper explained. “Nothing was ripe when Labor Day arrived. The heat spikes of that weekend that were so challenging in Napa saved our harvest. We really needed that last burst of heat to get ripe.” After that, things were much less eventful, as the Santa Cruz Mountains were not affected by the devastating October fires that wreaked havoc throughout Sonoma and Napa Valley. I tasted four separate lots of the 2017, along with the core blend as it exists today. The 2017 Cabernet Franc from Rousten Ranch is sumptuous, with striking aromatic presence and fabulous balance. Two of the three parcels at Rousten are destined for Monte Bello, while a third parcel will be bottled as a Historic Vineyard Series wine. Sadly, this is the last vintage of the Franc from Rousten for a number of years, as the vineyard is being replanted after falling prey to red blotch, a disease for which no testing existed when the parcel was planted in 2008. Intense savory notes and dense, dark fruit are some of the signatures in the 2017 Merlot. This terraced site yields Merlot with real pedigree and distinction. In 2017, Merlot plays a very minor role in Monte Bello. This is the only Merlot parcel that made into the blend. Every bit as impressive, the 2017 Petit Verdot screams with varietal character. Dense, powerful and structured, with a huge core of fruit, the Petit is compelling. The 2017 Cabernet Sauvignon Monte Bello Steep Terraces emerges from a parcel planted in the early 1960s. A rush of raspberry jam mint, graphite, cedar and white flowers infuse this deeply expressive Cabernet Sauvignon. In 2017, all of the Steep Terraces was used for Monte Bello. This blend of the 2017 Monte Bello comprises about 85% of what will be the final wine. At this early stage, the 2017 is distinctly medium in body, with a compelling interplay between the tannin profile and structural feel of a cold year and the ripe fruit of a warm vintage. That natural contrast is both highly unusual and alluring. Analytically, the 2017 has a level of tannin that is inline with vintages such as 2013 and 1996, but the expression of fruit is much more exotic. The 2017 is embryonic and not fully formed, it also clearly has the potential to develop into a truly special wine. 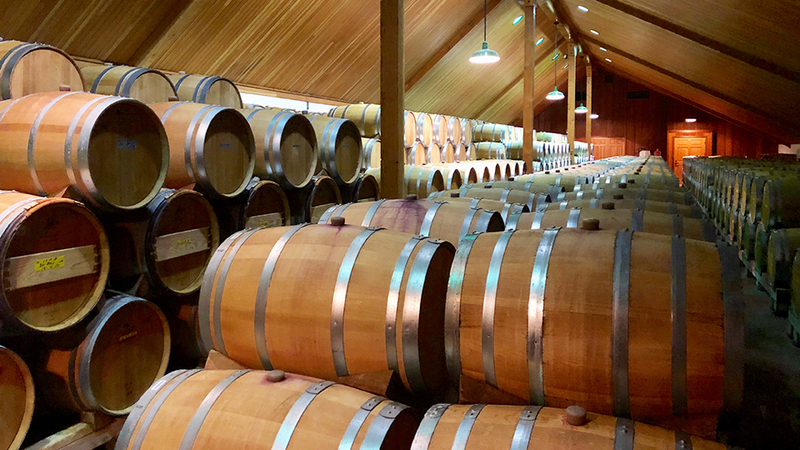 There are just five barrels of the 2017 Cabernet Sauvignon Monte Bello Historic Vines, a wine that is shaping up to be tremendous. The Old Vines emerges from a parcel planted in 1949 believed to be one of the three oldest surviving Cabernet Sauvignon vineyards in California. Powerful, deep and concentrated, the 2017 is simply magnificent. There is plenty of underlying structure, but almost no sensation of tannin because the fruit is so intense. Floral and spiced notes meld into a core of distinctly red-toned fruit in this magnificent Cabernet Sauvignon. Temperatures dropped into the 40s in August, something that had never been seen before at Ridge in the weeks leading up to harvest.